Bright Lights Big Stories was the theme of the 2011 RWA National Conference in New York City and, boy howdy, did they ever come through. Our hotel was smack dab in the middle of Times Square (my room overlooked the Good Morning America studios) which brought the bright lights and the terrific line-up of authors entertained and inspired with their stories. 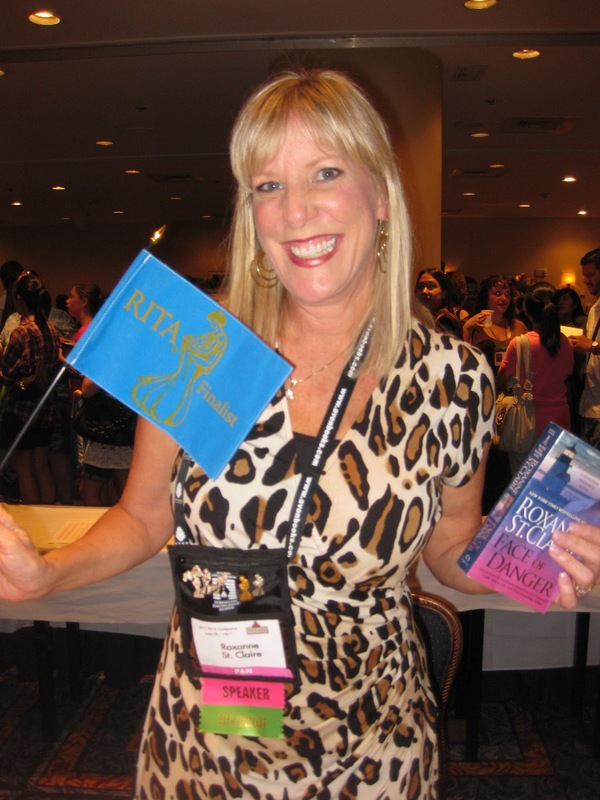 It will be fun to return to NYC later this month for RWA 2015. So many wonderful things to do...not nearly enough time! Karina Bliss and Colleen Gleason were all smiles and rockin' gorgeous fascinators in the hotel bar. Sabrina Jeffries, all dressed up for RITA® night. Sabrina kicks off a new series on July 21st with a familiar hero (from her previous series). American artist, Jeremy Keane will have his hands full with his English heroine in The Art of Sinning. It's so good! Rachel Gibson's books always make me smile. Her See Jane Score (Chinooks Hockey Team - Book 2) is one of my all-time favorites. Roxanne St. Claire is one of my favorite authors. She's also kind, generous and so appreciative of her readers. She recently released Barefoot With a Bodyguard, the first book in her new Barefoot Bay Undercover trilogy. Fans of her Guardian Angelinos will be thrilled to know that the elusive Gabe Rossi appears in the first two books of the trilogy and the third will be his story! If you're a fan of Robyn Carr's Virgin River or Thunder Point books, you'd probably expect her to be warm, welcoming and fun to be around. You'd be right. Another author who truly appreciates her readers, Carr is a gem. Her newest book, A New Hope was released June 30th and is another winner in her Thunder Point series. Jodi Thomas let me hold her RITA®! 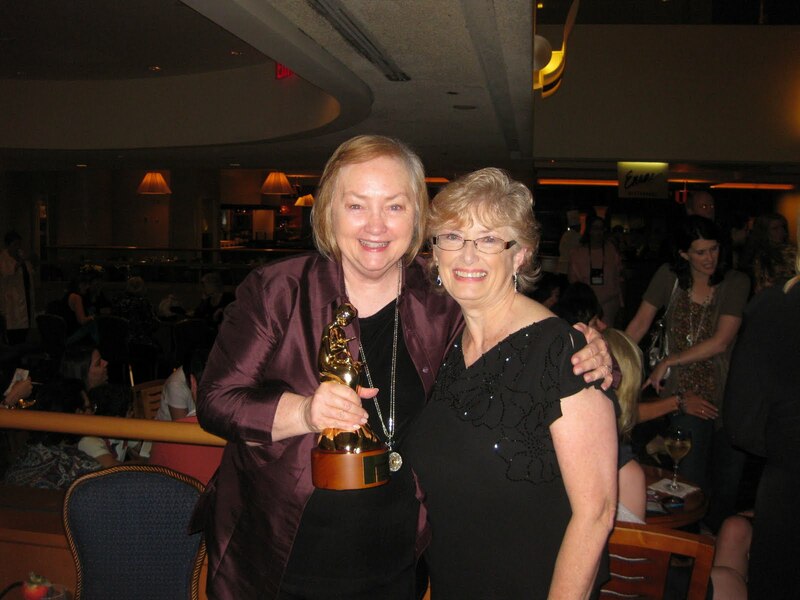 I had a wonderful time chatting with her and was so happy for her win. 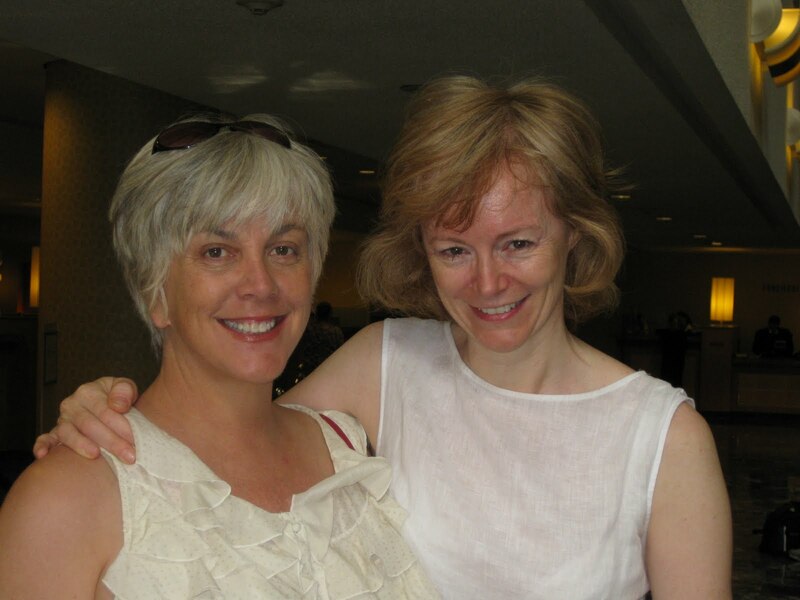 She's a lovely, down-to-earth, lady and such a good writer. You might think the twinkle in the eyes of Anne Gracie, Jo Beverley and Cara Elliott denotes mischief and merriment. You'd be right. This delightful trio had me grinning from ear to ear and their books have places of honor on my keeper shelves! 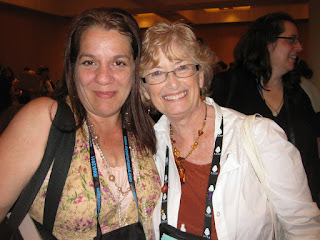 All my reader friends know I love my highlanders and Paula Quinn writes some of the best around. Her MacGregors are all keepers! Position yourself in the lobby of a conference hotel and you never know who you'll run into. 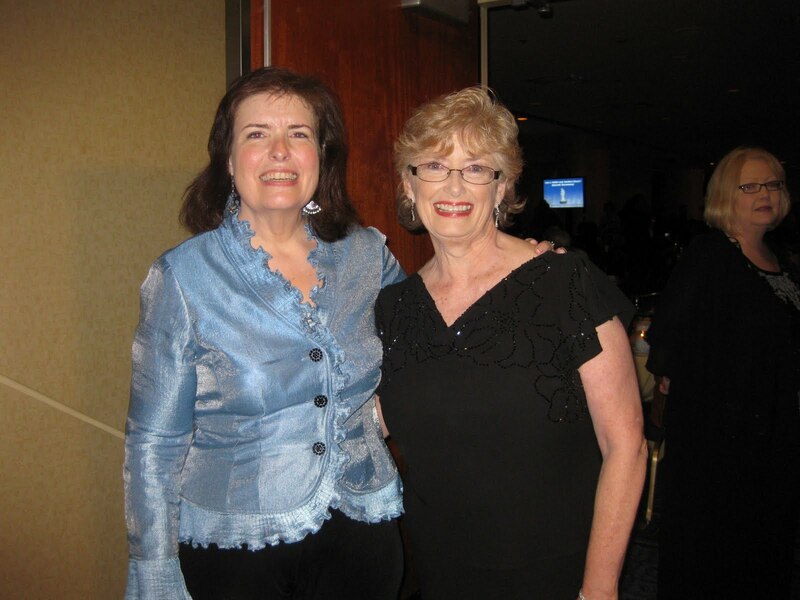 Maybe you'll hit the jackpot and have a cozy chat with Connie Brockway and Eloisa James! Have you ever been to New York City? What are your must-see attractions in the city? What city (cities) would you most like to visit? Any particular authors you'd like me to try to get photos of at the upcoming conference? Great pictures. Thanks for sharing. I've been to New York many times in my life since I live in New Jersey. But I haven't been in awhile. I definitely want to see the 911 Memorial. 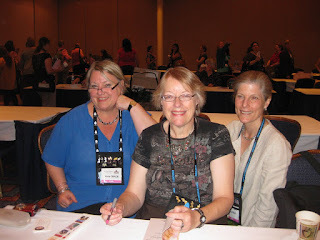 I'm also working on attending RWA. Thanks for this post & good luck to everyone. Let me know if you're coming. I'd love to meet you in person! I have never been to New York City other than through the airport. I would love to attend an RWA sometime. There are so many authors I would like to meet that I think it would just be fun to meander around and just run over and hug them when I see them. I hope you have a wonderful time and I look forward to your pictures! Start planning, Connie. The national conference is coming back to Orlando in 2017! I've never been to New York - city or even the state. As for dressing up I do enjoy it occasionally, but I am a total disaster when it comes to walking in high heels! One of these days I'll make a conference... I am loving all of these photos! Thank you! Glad you're enjoying the photos, Glenda! I stopped wearing heels about 20 years ago, when I left corporate life. My poor feet are all about the flats these days. This will be my first conference in NYC. I am very excited. I originally was on the waitlist but it has worked out and I am thrilled. I finished my WIP a week ago yesterday. It only took me four years. Ugh! It has only been since I lost my daytime job that I settled down and said "make some lemonade from them lemons..." and ta da, I did it. As far as NYC, I have been a few times, but the one thing I really want to see is the 911 Memorial. I'll be sure to keep my eyes open for you to say hello! Congrats on finishing the WIP, Annie! I'll be looking for you too! I visited New York City many years ago. A real adventure. I love to dress up but we rarely do since everything is casual and informal. Great photos. I would love to visit many cities, N.O., Destin, Charleston, S.F. I love Destin. The beaches in the Florida panhandle are gorgeous. I have been twice but only for a couple of days each time - I would love to stay for longer. We took one of those bus tours where you could get on and off as you wished and I really enjoyed the different guides - a great way to learn the history and see the sites. We got to see The Lion King which was fantastic so a Broadway show is a must! And the food...I really enjoyed Little Italy and China Town. We don't travel too much any more but I was thrilled visiting anywhere and everywhere. Since I don't dress up very often, I find it a nice treat. I'm sure whatever photos you take will be great! I took the bus tour the first time I visited. It's a great way to see the city! I love seeing your pictures from each conference. This year try to get a picture of you with the duo of Shalvis and Higgins. I'd like to sit and have a margarita with them because I bet they are a hoot! Do you think the conference will make it back to Atlanta some day? I don't know when the conference will come back to Atlanta but it won't be before 2020. I'm so sorry! I hope IE works better for you. I only live about an hour west of NYC, but rarely go in anymore. I used to go in at least annually to see a broadway show or maybe a museum (always loved the Museum of Natural History). I'd love to go in and stay at a hotel for a few days. I hope you have a wonderful time - I'll look forward to your posts! note: JCP is correct - Ellis Island is a fabulous visit. Di, you should think about coming in for the Literacy Signing. It's Wednesday, July 22 from 5:30-7:30, free admission and open to the public. I visited NYC a very long time ago. In fact, I was able to go up on the observation deck of the Twin Towers, it was that long ago. I would love to go back and visit Central Park, a broadway play, and the MET. Thanks for sharing! Love NYC! But haven't been in a while. And take all the pictures of authors that you can. I fan-girl over them every chance I get. 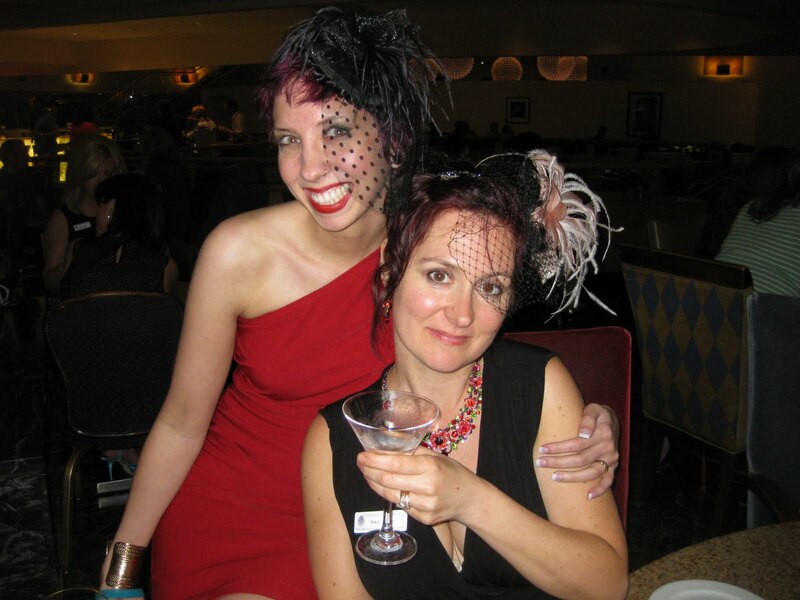 I've been to several reader conventions and love interacting with them. Thanks so much for sharing! I went with some classmates who lived on Long Island the end of my junior year in college. Ahem, that was 1967 and I never got to see the one thing I was hoping to, the the Museum of Natural History. I did take the elevator to the top of the Empire State Building and went out to the Coney Island Beach. As broke college students on spring break we didn't have any money plus the students I went down with weren't on great terms with their families. I don't know how students afford the spring break trips they do today. No one we knew did much back then. We were lucky to have money for the train and subway. I have been back since. I am a Red Cross Disaster Volunteer and spent 3 weeks there after Sandy. Needless to say, I didn't do any sightseeing. My husband and I would love to go to New York City to see the sites and go to a show or two. Chicago is another city I have wanted to visit, and we are going in September. Great museums, She'd Aquarium and Irish music. I love to dress up, but rarely have any occasion to do so. I don't she will be attending, but a picture of Julie Garwood would be nice. Maybe some day RWA will try to come to Nashville again. It would be nice to attend. I almost got to go as a librarian when it was scheduled there but flooded out. I love Chicago! I grew up across the lake but had relatives in the city so we visited often. September is a great time to visit. I live 1 hr from NYC so yes I have been to see the Empire State Bldg, boatride along the Hudson/East River by Ellis Island and the Statue of Liberty. Go to see several plays. Loved the Museum of Modern Art as well. I should really try to get to book events in the city; but have not as yet. Are you planning to come in for the RWA Literacy Signing? It's at the Times Square Marriott Marquis hotel from 5:30 - 7:30 on Wednesday, July 22. There will be over 400 authors signing! You must have had a fun time. I have been to NYC many years ago. Loved it. Would love to meet Debbie Macomber. Took my granddaughters to see the Rockettes Christmas show last year and go in to see plays occasionally. I have been to New York City several times. Would love to meet some of my favorite suspense writers.